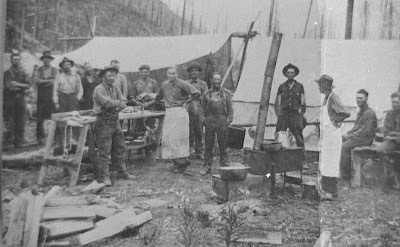 Granville Gordon family tent camp moving into Bull River area 1905. Courtesy Granville and Pauline Gordon collection. While men were settling families and establishing respectable communities and lumberjacks were flocking to the region, finding ready employment in nearly any canyon they chose, back east in Washington, D.C., lawmakers had also cast an envious eye on this remote region. With the swiftness of lightening, laws resulted that would forever take control over the livelihood of those living in the Clark's Fork valley. Early in 1906 the same newspaper that had so promisingly encouraged the creation of forest reserves was shouting foul as loudly as were its readers. "To say that the people of Sanders County were displeased when they became acquainted with the boundaries of Cabinet Forest Reserve would put it mildly. There were very few of us who were not hot under the collar and getting hotter still," said the February 2nd edition of the weekly paper. Blustery March weather heralded President Roosevelt's proclamation to finally set aside an area along the Kootenai River and the Clark's Fork of the Columbia River in western Montana and northern Idaho for conservation purposes. In Noxon the news was greeted with a mixture of emotions and reactions, and Clifford Weare began a tenacious, unrelenting struggle against the foresters. Roosevelt set aside that portion on the Kootenai watershed to be known as the Cabinet (N) National Forest, while the region drained by the Clark's Fork River was christened Cabinet (S) National Forest. Meetings were held throughout the western portion of the county and a flurry of letters went off to Congressman Jos. M. Dixon protesting the action. Dixon quickly replied, defending congress, explaining the Reserve was the creation of the President Theodore Roosevelt and the Secretary of the Interior. Two men, O'Dell and McGoy, came into Noxon posing as government timber agents there to sell timber on public lands and were long gone before it was discovered they were frauds. On April 1 (some would say, April Fools Day -- an appropriate day for a foolish move), Ferdinand Augustus Silcox assumed his charge as the Cabinet's first Assistant Forest Supervisor. 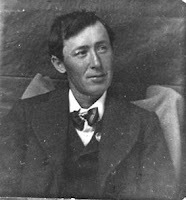 He arrived in Noxon in 1906 from the San Jaun and Montezuma Forest Reserves where in Durango, Colorado he'd found things wild with two solid blocks of saloons on the west side of Main street, dance halls and gambling parlors running openly across the tracks and the town marshal had recently killed Sheriff Bill Thompson in a gun fight.1. Silcox and his crew of five or six men at first seemed innocent enough, the only outward difference seeming to be the forest green uniform Silcox wore. 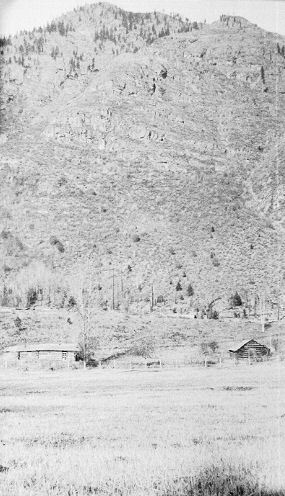 Living from tents they pitched on the Caspar Berray ranch they spent from early spring until late summer in 1906 surveying the Bull River country, only coming to town for needed supplies. 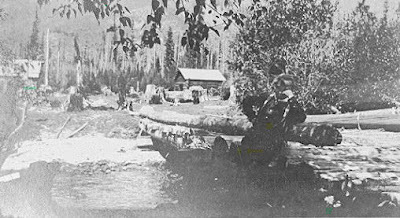 Service Ranger on Bull River. ﻿﻿﻿Soon men gathered around Weare's pot bellied stove had yet one more topic of high interest; the land was being surveyed. The federal government was making its initial entry into the valley. Granville, 'Granny', Gordon and Clifford Weare took Silcox around to look over the forest district. Granny was Stella Jane Bauer's brother. They'd arrived at Noxon in 1905 as part of the Bauer's wagon train. Granny, his wife Pauline (Reithmiller), their baby daughter Stella, and his mother traveled by covered wagon from Sheridan, Wyoming where Granny had guided for Buffalo Bill Cody's resort. Weare said Silcox's party walked because there were no riding horses to be had, but more likely Silcox walked to learn the terrain first hand. Ed Hampton had a couple of teams but the town had no stables yet. Indian teepees periodically dotted ancient campsites several hundred yards upstream from the mouth of Bull River on the east side. Remains of an old fur trappers supply station, surrounded by brush and trees, deteriorated on the opposite shore north of the Indian campsite. Indians also encamped near the mouth of Pilgrim Creek when they came on hunting forays. Circled rocks and other evidence remained on ancient sites scattered throughout the Bull River valley as well. Soon rumors began to circulate that both Silcox and Gordon had fought with Teddy Roosevelt on the San Juan Islands. And when settlers learned about Silcox appointing Forest Rangers without the recruits having first taken a ranger examination, they were derisively dubbed 'instant' rangers. ﻿﻿However, the Assistant Forest Supervisor who was to put his brand indelibly on the conduct of the Cabinet National Forest and change its management forever came by his command following years of study and work in forestry. Silcox descended from a blockade-runner grandfather, with his father a successful cotton broker in Charleston, South Carolina. Ferdinand Augustus grew up amid the schooners, brigs, brigantines and full rigged ships dropping anchors there. He sailed and fished, became bronzed as an Indian, and joined in hunting expeditions through pinelands and swamps. Silcox looked on life as a series of exciting adventures. He took honors in all his schooling which included sociology, chemistry, and all the school had to give of botany, silver culture and ofentomology, mensuration, engineering and law in relation to forests and forest operation. Somewhat of a non-conformist, he sought fresh points of view and new knowledge. He held the conception of forestry as a pioneer program that demanded leaders who were resourceful, courageous, endowed with common sense and capable of inspiring confidence, and deserving it. He was an athlete, and on one of his first forestry jobs serving as a timber cruiser in West Virginia, local people referred to him as "that 'air circus feller" because he frequently walked down the road on his hands instead of his feet. Weare didn't hit it off with Silcox either personally or ideologically, his own convictions leaning strongly in favor of the public owning the timber meaning anyone who could cut it the fastest. And he, too, had had grandparents in the Civil war and was imbued with strong childhood memories of tales of that conflict. He had a good business going, dealing in timber through the Posts and Poles Store he'd established a couple of years before Silcox's arrival, and felt if the government were left unchecked, with an 'eye' on it's resources, a stranglehold on the timbermen would result. So at first Weare made an effort to befriend Silcox and thereby be able influence him. Realizing shortly that this wouldn't be possible, he became a staunch enemy, doing everything he could dream up to thwart Silcox' efforts to staunch the supply of public timber being harvested. On the other hand, Silcox was one more man of refinement added to the very few who were here already. Sincere and enthusiastic, with mental agility and physical endurance, he commanded respect and acquired friendships easily. But he really wasn't an explorer or woodsman type. In Montana he didn't hunt or fish or climb mountains just for pleasure. He liked people better than he did the woods and although he was tough, wiry, athletic and a good tennis player and strong swimmer and good boatman, mostly he loved to talk and was a most fluent conversationalist. He used his remarkable memory to pick up from other people an expressive phrase, an idea, or a piece of factual information and then assimilated it and used it himself. It was an extremely valuable talent, allowing him to talk knowledgeably on many subjects.1. Caption: Augustus Ferdinand Silcox, first Assistant Forest Supervisor at Noxon. Circa 1912. Courtesy Granville and Pauline Gordon collection. That the Assistant Forest Supervisor used his government position to inject eastern cultural ideas into the valley separated him further from many of the people whose incomes he controlled. Residents who sorely missed the civilized cultures they'd left behind them and were striving to introduce them into this wild wilderness, welcomed him. He was not without champions. Among those who conversed around the pot bellied stove were strong proponents of naturalists, Jefferson, Franklin, and Benjamin Rush, who had considered man's impact on his environment to be beneficial. Others voiced as loudly the ideals that had originated with George Perkins Marsh publication of Man And Nature; ideals that explained the relationship of soil, water, and vegetative cover. Marsh's writings had shown clearly that man's destruction of grass and forest cover caused alterations in the soil and water supply, changing the physical condition of the earth. Educated and well read, the settlers pointed to accounts of the once productive land that had become desert in China, Europe and North Africa. These were men who were glad that the government had harkened to these concerns and had created the national forestry commission out of which had grown the forest service in 1891. Watching the timber hawks stripping the land, they thought its time had come for the valley. Still, much talk was bandied in the saloons over Silcox's habit of taking a cold bath each morning before breakfast, his pea green uniform, little ax, and his compass dangling on a little silver chain. His polished manners stood out in the rough company of the lumberjacks and miners. Weare claimed Silcox didn't know one species of tree from another so he hired Granny Gordon to teach and show him; nor did he know a hedgehog from a bear and believed hedgehogs (porcupines) could throw their quills. ﻿ Without a doubt much of Weare's animosity arose from imposition of the law that forbade him to cut timber from public land. Foresters always had to keep a close eye on timber sales made to Weare to be sure he didn't slip and cut from public or private lands outside the boundary of his sale.3. Most of the settlers who'd already located land treated Silcox with cautious courtesy. All were soon aware that he could challenge their right to remain. Homestead laws stipulated the land must be suitable for agriculture. This was timberland. Mountainous land; steep and rocky in many places. Their applications to homestead would need the new forest supervisor's approval. With Silcox' arrival tales of earlier settlers in the Idaho lands to the west who had been driven from their lands by other such government men brought sleepless nights. Years of struggle and work could be lost overnight if he decided to deny their claims. 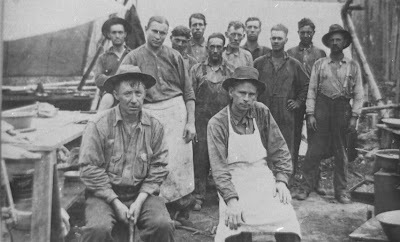 "So we went over by the water tank on the Northern Pacific Railroad where Silcox, Gordon, VanDyke, and Buckhouse were frying eggs over a campfire, preparing to eat their noonday meal. Mickey vouched for me as good sound material. Soon we had the job landed. "Silcox informed me I would receive the Official Appointment from Washington in due time. I should report September 22 at Noxon with Bed and proper clothing to last several weeks and they would take me out on the job. Mickey and I were Pals from then on and Rolled our Blankets together. "After putting a stop to the timber stealing, Silcox picked a crew of men for the Forest, mostly local men who had participated in the timber stealing." Forest Service camp at Bull River circa 1907-08. Courtesy Granville and Pauline Gordon collection. ﻿﻿﻿When his ideas of conservation were inaugurated the chief forester's attitude toward the people in the undeveloped and sparsely settled region was that the people, in their ignorance and selfishness, were quick to scorn and criticize forest service policies. "The work was new to all and there were numerous tangles and snarls that had to be ironed out. However Silcox succeeded in getting the idea across to all that it was the duty of each and every one to protect the natural resources of Uncle Sam. It was progress catching up with wanton waste and the people of the United States had been promised that in due course of time we would have a workable organization that would get results. Silcox wielded the 'big stick' with such prudence and discretion that he won over many converts for conservation." Others said, "You can fool some of the people all of the time but you can't fool all of the people all of the time. It's just the government stealing the people's land." Michael Roddy was the first forest guard on the newly created National Forest. Other temporary men in 1907 were J. J. Blythe, A. E. Comstock, C. C. Chisholm, Roscoe G. Dingle, E. Roy Engle, Isaac Engle, George Gardner, Chas. J. Kress, Andrew Leopold, Chas. M. McCauley, Chas. Mercer, Chas. E. Munson, and B. F. Saint. 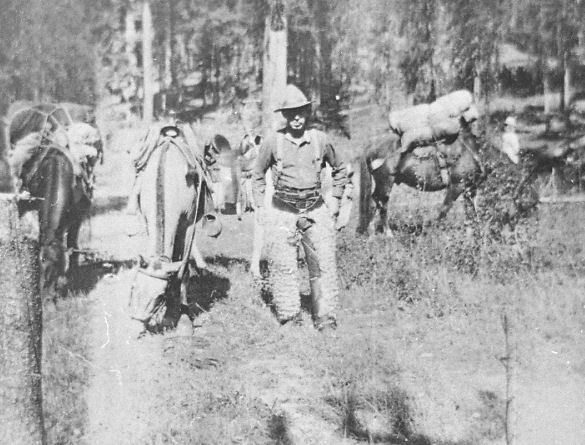 Forest Service Crew circa 1907-08. Courtesy Granville and Pauline Gordon collection. ﻿﻿﻿The first permanent Forest Service employees were W. A. Anderson, R. H. Bushnell, Granville J. Gordon and G. M. Van Dyke. Miss Winifred Hogan acted as Clerk. There were no fires in 1907 so the fledgling forest service crew accomplished a good deal that first year. Saint's employment on the forest began with the little band of men gathered together by Silcox for the task of preserving the huge forest reserves. 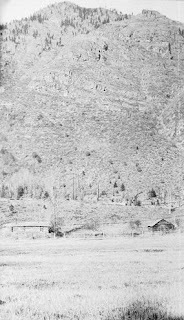 They walked from Noxon to Smeads, crossed the Clark's Fork River by ferryboat, and camped in an old barn. The trail to Squaw Peak can be seen in the background. Courtesy Wallace 'Wally' Gamble collection. ﻿They found one, but it was over on the other side of the mountain range. They didn't return to camp until 2 a.m. the next morning. "At breakfast we were informed that we had started our trail work in the wrong direction and would have to move camp up into the Bull River country," Saint said. "Mickey and I were selected to go some two miles down the Old Kootenai Trail and pick up the tools and then come on up Bull River to the new campsite at Star Gulch. Neither of us had ever been up Bull River but that didn't matter." Expecting to catch up to the Pack train at their lunch stop, the two men started walking the old Tote Road trail but the crew forgot to stop for lunch. Nine miles into the valley they caught some of the other men following the pack train. A mile further they passed the first settler near the road and inquired about the pack train, learning it had gone by an hour before. "Along about dusk we found the outfit. Or at least part of it. They were on one side of the river and we were on the other. Then I learned something about this Montana water. You cannot estimate the depth by standing on the bank - if it looks to be two feet deep, multiply by four and get ready to swim! "Once across the river we were ready to eat. Well, not quite. One of the packhorses (that ain't what Mac, the packer called him) had broken loose from the string. Yellow jackets, I think, started the parade. We were all detailed to search the woods for canned goods - milk, corn, peas, beans, tomatoes, etc. All came back just after dark laden with food, plenty tired and hungry." "We had plenty of money. Uncle Sam was liberal with cash then, and it was up to us to make something of it. The Public didn't like the idea of conserving the Forests and demanded that we show a profit at an early date with the new scheme, or else. Well, we were there to make good. "Two men were designated foreman: Issac Engles and Andy Leopold. Mickey and I drew Andy, the Big Polander. Jean Comstock was cook and general advisor. Both Leopold and Comstock had served in Uncle Sam's Regular Army so Mick and I got off to a bad start. I don't know what saved us, unless it was because we both liked Silcox so well. "The Cabinet Forest had some mighty fine men at the helm to see that the old ship kept her course and Silcox was the finest. "Our crew went to the top of Squaw Peak and worked down building trail while Engle and his crew started at the bottom and came up to meet us. 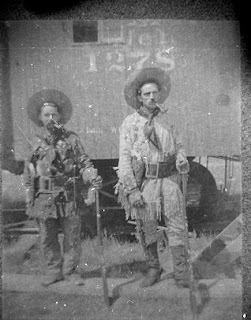 Leopold and Comstock cautioned Mick and I that Uncle Sam did not expect too much from his men and that we would work ourselves out of a job if we didn't slow up. Mick and I reasoned that Old Dad Engle and his crew of four men were working. And somebody had to make a showing on our end. "Mick and I held up on our end for mileage, however not so wide for tread, but good enough, so we were told." ﻿The Squaw Peak trail was one of the first to be constructed in the west end of the Cabinet Forest. The crew stayed in Star Gulch until, late in November, frosty mornings turned to snowy ones, which drove them back to their first camp on the Kootenai Trail where they began building a bridge across Bull River. It was all hand work. 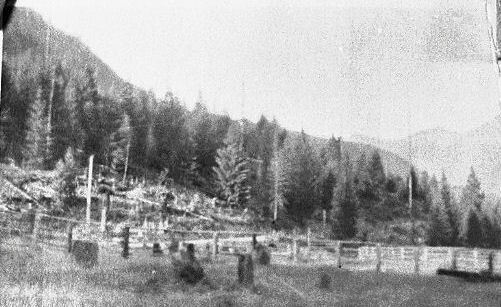 When the abutments and the stringers were in place, after walking to Noxon to attend the New Year dance, they returned to the Bull River Ranger Station site.4. 1907-09 on land taken from Marion Cotton, where first Ranger Station is to be built. Unidentified Forester by bridge in foreground. Courtesy Caspar Berray collection. "To serve the people in a community in the greatest degree possible, stations are constructed at ten mile intervals or less, even in sparsely populated regions (railroad) the same principle is also applicable to the Forest Service business, hence the necessity of ranger stations or administrative sites."5. SMEADS, Sections 4 and 9, 152 acres.6. Partners, Marion Cotton and Pat Moran, had settled on 160 acres of choice land bordering Bull River in 1903. At the lower end of it the swift flowing East Fork of Bull River had its confluence with the main river. It had a neat clearing surrounded by tall cedars, tamarack and white pine. McJunkin had the land first, then Doc Smith acquired it when McJunkin pulled up stakes and left. Smith let Mr. Green and his wife have it. They lived there with their three small children in the one-and-a-half story house McJunkin had built. Upstream about a quarter of a mile, sandwiched between Green and Berrays, 'Dutch' Henry Scheffler, a butcher from Helena who kept dogs had built a two story log house and a barn and began clearing up land. Another settler, Pete Hatch and a man referred to as 'Old Man' Hatch lived just downstream from Green's, up against the mountains. Homesteaders still living at time this book was written remembered differently how Silcox acquired the land for the Bull River guard (or ranger's) station. Bull River homestead fences. Circa 1906-08. ﻿﻿﻿"Old Man Green was the railroad foreman down at Heron. Gene Green and his two sisters and his mother were living there. I stayed on Bull River with my grandmother and Uncle Jim during the summer when school was out. I saw this black smoke going up so I says to Jim, I believe that's Green's house afire. We hopped on a horse and went down there. Everyone was out of the house. It was ablaze so you could hardly get near it. Green had brought up I don't know how many dozens of torpedoes from the railroad. And there was old guns and everything else going off up there. All of this was flying through the air in every direction. "We dodged around and got in there and the ceiling was starting to fall. We grabbed her sewing machine and here come the ceiling down. That's all we saved. There was a cellar and it filled up with all the burned stuff from the house. Jim and Caspar Berray homesteads. Clifford Weare, who was a generation older than Frank Berray. 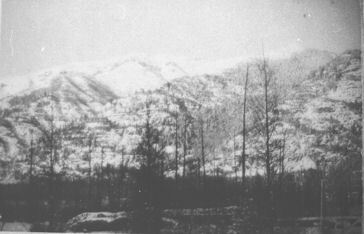 Cliff lived in Noxon, and harbored bitter memories of the event. "Silcox told Green he'd have to move off, it was to be an administrative site. But he offered Green a job with the forest service and told him his wife would have a job, too. Green fell for this talk, and his wife was delighted, and they gave up their homestead on Bull River and moved into the Noxon Ranger station. Gordon went to work for the forest service, moved into Green's house on Bull River, and began construction of the first Forest Guard Station on Bull River. Gordon became the first Ranger there." Neither version is completely accurate. 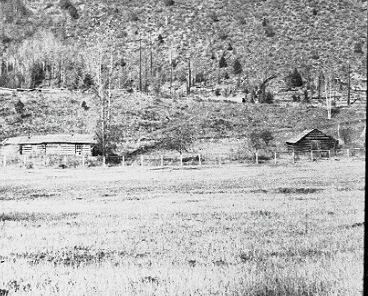 Cotton and Moran settled on the vacated land that adjoined the Berrays in 1903 and began to prosper, raising cattle and operating a butchershop at Trout Creek. They fattened the cattle on the natural meadows, and had farm equipment. When they butchered a beef Moran sold it at the barbershop. In May 1905 Marion married Lilly Jenkins, and within two years the couple created a snug home about mid-way between Berrays' and where Moran continued to live. His snug little cabin occupied the clearing close to the old Indian campsite near the creek at the lower end of the homestead. But Cotton's happiness on Bull River was short-lived. First off, Moran left in mid-summer. Shock rippled throughout the community when Silcox chose Cotton's place for the first forest guard station. He and his crew proceeded to survey a portion sufficient for a ranger's station and barn. He reasoned that the 120 acres reserved from homesteading should be sufficient for garden, orchard, chickens, and pigs, plus pastureland for horses. The new 'administrative site' included the cabin Pat Moran had occupied before the newspaper reported his mysterious disappearance earlier that year. "August 1907, Heron, MT. Dear Mr. Pinchot ... I settled on my claim in 1903. I made an application to the forestry for 160 acres commencing at James Berryes (sic) line and run down Bull River. Now Mr. Silcox has run out a rangers quarters at the lower end of my claim. They took in part of my improvements, land that I have been cutting hay from and buildings that I have used for hay and fed my cattle there even last winter. Grandma Gordon's cabin sat across the road from the Bull River Ranger Station. Courtesy Granville and Pauline Gordon collection. "Sweet little Mrs. Green and her kids in the spiders home. Not long until that pea green uniform was seen out walking with Mrs. Green. And others liked to walk with her, and soon the bubble burst. She left the valley with one of the (forest service) crew for parts unknown. Three or four months later her husband received a letter, to come and get her, and please forgive. He replied, 'you made your bed, you sleep in it.' Next letter said, 'When you get this letter I'll be dead'. She shot herself but didn't die right off, so her brother went after her. "Coming over the mountains the wound got to bleeding, her lungs filled with blood and she died in the hospital in Bozeman." Weare chalked up another score in his growing hatred of the Forest Service.7. And Cotton's letter didn't do Marion and Lilly much good, although years later the government awarded them '$100 for the improvements' Silcox appropriated. Nineteen-year-old Ben said, "Silcox was one of the few men that I have met and known in my short life to whom I felt that strange attachment that is indescribable. To have known him was a pleasure and to have worked with him during the early days among the trials and hardships of the Forest Service is something worth living for. "He possessed a great understanding of human nature and was so fair and honorable about his feelings with mankind that men whom he penalized for timber trespass were afterwards staunch friends and admirers. Men who worked for or with him would work their daylights out for him. No man ever went farther or did more in a day than he. It is no wonder the Cabinet Forest got off to a flying start and kept right on going thru the years to come. We took a lot of hard knocks and many jeers from the general public but never quit fighting until the battle was over." Marion Cotton read the newspaper story, but although he realized it wouldn't really be the end of the rumors circulating in the communities since he'd said goodbye to his partner, Cotton smiled with satisfaction when he read the Sanders County Ledger one rainy fall day. "It will be remembered that some time last spring one Pat Moran disappeared - it was thought he had either been done away with or killed accidentally in the mountains. He owned one half interest in a ranch, 50 head of cattle, farming machinery, etc.- which were about to be sold. "Marion Cotton has informed me that you have entered a suit against him for selling my stuff off my place on Bull River. I wish to inform you that he is justified in doing so and ask you to drop it at once as I am here and well.' Signed Pat Moran."1b. The sheriff's office sent a personal acquaintance of Moran's to Erie to ascertain that he, indeed, was alive and well. When the man found him so, afraid that his own testimony might not be believed, he also brought back signed affidavits from the couple with whom Pat Moran had been boarding and rooming. The matter was settled legally and only remained in the legitimate proprietary realm of community gossip. There were even some who speculated that the newly created Forest Service might be involved in some scurious way. After all, Augustus Silcox, the Forest Supervisor intended to 'reserve' lands for future adminstrative sites, thus taking away homesteads where folks were already well established and evicting them.1b. 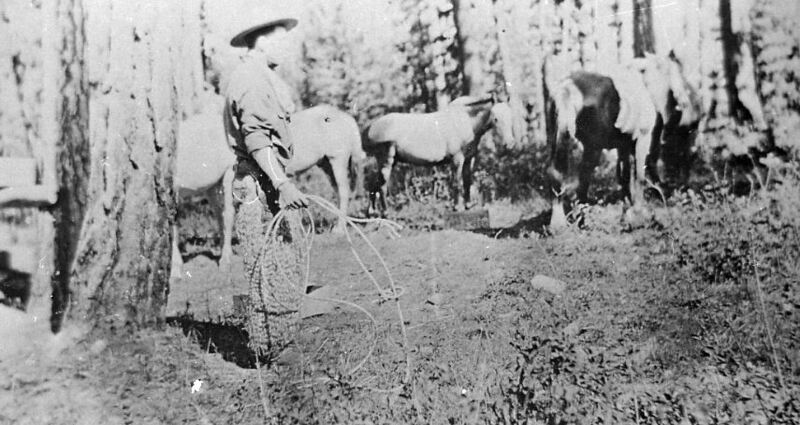 USFS Ranger Granville 'Granny' Gordon out to catch the horses. Courtesy Granville and Pauline Gordon collection. When Silcox was promoted to Forest Supervisor and transferred to Thompson Falls he left the crews he'd hired at Noxon under his appointed Rangers. He open an office in Thompson Falls and begin laying out the laws of the newly formed forest; laws intended to bring an abrupt end to the earlier way of logging by rounding up the settlers for timber trespass. There were many homesteaders who felt the pinch and animosity towards Silcox and his fledgling forest service crew ran high.2. Roy Hedley, a western-bred farmer/logger with a college education, succeeded Silcox who was promoted October 30, 1907. Headley, the government felt, could handle the "position wherein the virtues of a Napoleon would be taxed to the boiling point." worn when he performed in Bill Cody's Wild West Shows. ﻿Hedley took the train from Thompson Falls to Noxon in mid-January, rode horseback through deep snow to the Bull River Ranger Station, and layed off some of the men until spring. Mickey Gardner was one of the first to lose his job. He'd gotten on one of his regular drinking sprees and had forgotten to water the horses. The rest of the crew returned to work in March. The ranger station built by the forest service crew on Bull River was a two story structure of hewed cedar logs 20' x 24' erected at a cost of $477.58 including material and labor. Jim Berray, the finest axe artisan around, hewed the logs. The building progressed under the supervision of Granville 'Granny' Gordon, the newly appointed Ranger. Noxon Ranger Station. Circa 1909. Clark Griffin was Ranger there in 1908. 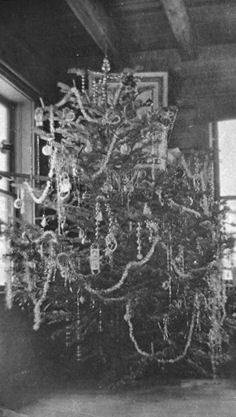 Courtesy William and Nettie Ellis collection. 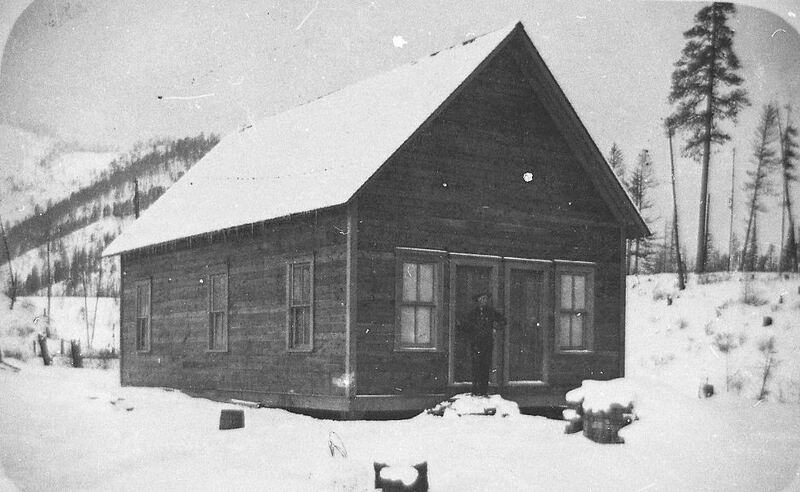 When it was completed the following year Noxon was the first frame lumber house in the valley and the best-equipped station on the Cabinet National Forest. "The cabin (ranger's office\house) is 20' x 34', five room frame structure boxed with 12" boards and bevel siding and ceiled with 4" flooring in a vertical position over 12" boxing laid horizontally, building paper being used both in and outside. Single 4" flooring, single partitions of 4" flooring and beaded ceiling. The total cost of the cabin to date with two coats of paint is $510.24. "The barn is 20' x 24' x 14' to the square, four stalls with a feedway in front, cinder floor, an 8' x 10' feed room, side with surfaced boards and bats. The cost of material for this was $129.23, and labor, which was Ranger labor exclusively, amounted to $105. A 12' x 18' tool house and store room cost $80.91 for material, and Ranger labor $66.25. This building is 10' to the square, 12" board floor and boxed with surfaced boards and bats. $21.44 was expended for material for the cellar and $57.50 for labor. It is built of cedar logs and set in a bank of earth, which protects it to its full height and length. The interior is 6' x 8' with 6' walls and a double front wall with dirt between and also double doors. The roof is double boarded and covered with dirt, which has been sown with clover to prevent washing. "One important improvement of this station is a water system which furnishes the Ranger with water for house use, stock, garden and fire protection. Three users of our townsite Special Use are adjacent to the station also secure water for house use only from our system. The source of supply is a spring 86 feet above the cabin and 1,330 feet from it. The water is conducted from the spring to a reservoir seven feet deep and five feet in diameter and from here a 3/4" galvanized pipe carries it to the station. The reservoir is placed in the ground below the level of the spring and is built of brick and lined with cement. Material cost $99.62, labor $42.50. The entire system, after a few minor changes, has given all that was expected. The entire station is enclosed with a three-wire fence on posts one rod apart. The cost of fence material was 16 cents, and labor, 28 cents, per rod."9. 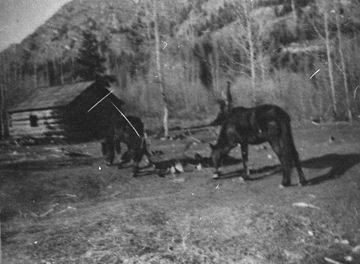 In the Bull River valley, another cabin a couple miles upstream from the Berray's got tagged with the name, THE HORSE THIEF RANGER STATION, from an incident that occurred there during the early administration of the Forest. "During the summer of 1907 four Forest officers, who at that time comprised the whole force of the Cabinet, were camped in an old cabin on this site. The one lone packhorse of the outfit was picketed near the cabin. "Sometime during the night one of the officers heard a noise as if someone was talking in low tones in the vicinity of the horse. He immediately awakened his bedfellow and together they went to a small window in the side of the cabin to watch and listen. The night was dark, but their keen eyes could distinguish the figure of a man moving about the horse. "They were satisfied that it was a horse thief about to depart with the horse and that prompt action was necessary. Where upon the second officer, the only one of the crew who had a gun, went to the head of his bed to secure his six gun while the first officer secured an axe which was handy and returned to the window to watch further developments. "The second officer, while securing his gun, grabbed hold of the third officer, who was a sound sleeper and had not heard the horse thief, and by hard shaking managed to awaken him sufficiently to inform him that someone was trying to get away with the horse. "About this time the first officer, who was guarding the window with an axe, whispered that the thief was coming around the house towards the door, when "SLAM" a heavy body is thrown against the door, which binds on the floor in opening, and the outline of a man is seen entering. "The third member of the party was becoming interested by this time and immediately challenged, "Who's there?" "It's me," came in disgusted tones from the fourth member of the party who had been out untangling the horse which had become tangled in the picket rope."9. Horse Thief Ranger Station. Circa 1909. Mare named Pet; colt named Fred. Courtesy Howard and Hazel Ellinwood collection. July l, 1908 President Roosevelt signed another proclamation remolding the Cabinet N Forest into a territory of l,020,960 acres having boundaries of the Idaho-Montana state line on the west, Flathead Indian Reservoir on the east, the Kootenai-Clark's Fork Divide on the North and St. Regis-Clark's Fork Divide on the south. It was named Cabinet National Forest. One of Hedley's first priorities was to connect the widely scattered ranger stations with district headquarters in Thompson Falls. Telephone lines were his answer but putting them over the mountains wasn't easy.9. His crew began stringing a telephone line down Bull River. It was Number 12 wire, strung tight and tied securely to the trees. When it was strung the wind blew and down went the line. Lesson No. 1 in telephone line construction: Line too tight. Solution: Cut the tops out of those trees so the wind won't break the line. "OK. We started right in," Saint said. "We were all green men but learning fast. The tree toping did not appeal to us at first but after a day or so it was not bad. "They didn't ask if you could do it. They talked as though we'd been doing it all our lives and after the first few days no one even suspected but what we had. Later they adopted what was then known as the split tree insulator which allowed the wire to pull thru and keep the wind falls from breaking the line."10. The Cabinet Forest spent close to $10,000 in building telephone lines erecting one from Plains, Montana to Hope, Idaho, using 2800 poles. Quite a boost to Sanders County's economy. During the summer of 1908, while the forest crews were in Bull River still building trails and telephone lines, they also got their first taste of fire fighting. In August every crewman was called out on fires. Some went to other forests. Van Dyke and Saint were sent to the Pend Oreille when fire broke out on Twin Creeks, near Clark's Fork, Idaho. Van Dyke had a saddle horse and Saint had a good packhorse broke to walk and lead. Saint was going to face his first forest fire. "It was a long journey and while enroute I had considerable foreboding as to what I was going to do about it. I knew how to fight a prairie fire but a forest fire was different. "I brought up the rear after having walked and lead a packhorse loaded with supplies some fifteen miles. The camp had moved from Twin Creek to the top of the mountain so I kept going, eating berries and worrying what was I going to do with that fire when I got there. God knew, I suppose, for I didn't. "It turned out to be easy as pie when I got there. All I had to do was pack the supplies from the end of the road to the fire camp. Had a lot of packing experience? Well, no one asked me about that. 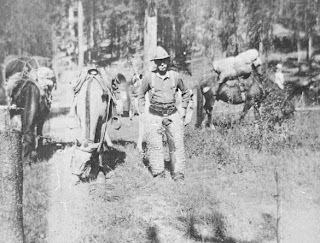 I had a Diamond hitch on the packhorse and the pack was on him when I got there, was all." A week later the wind came up a second time creating more fires than experienced men. Saint was sent off to a spot fire in charge of a crew of experienced fire fighters but lacking a cook or a packer. "All I had was a time book and a badge. Again God came to the rescue. We made camp and I asked who could cook. The men all looked blank. If you never saw a bunch of firefighters look that way you have missed something! "One fellow, more bold than the rest, looked me over and said, 'Hell, we don't know anything about cooking! What you say we put out the fire and you do the cooking and packing?' Saint put him in charge of the crew and became camp cook himself until a week later when the Cabinet Forest recalled him and Van Dyke for fire fighting near home. "After a ten mile ride, me on the pack saddle, we got into Heron at eight p.m. We waited for the train that came in at midnight with a six man crew for the new fire then started for the fire thirty miles away through the mountains with a trail only part of the way. I picked up another crew of 20 men enroute from another fire, all out of grub." Two days later the twenty-six men reached the fire but had only a weeks rations for six men. Twenty men were released when a light rain hit the twenty-acre fire shortly after their arrival. Saint and five men to finish putting it out. Expecting to be supplied with rations by the ranger from Noxon, they stretched their one-week's rations as they fought the fire two weeks before the fall rains came. "We stuck around two days in the rain then we started for home with what we could pack on our backs. Van Dyke and a packhorse load of supplies met us about half way out. "Mel wanted to take the supplies back to the store but we were six hungry men. We unloaded the supplies and ate what was the best meal I ever ate!" The government agency began having labor difficulties with the hiring of fire crews. Saint recalled, "In every fire crew we seemed somehow to draw an agitator or trouble maker whose wails were numerous. Kicks on hours allowed and poor food furnished, it was quite a problem for the ranger to solve. "We were instructed to keep these men on the job if possible for many of the fires were far back in the forest and it was hard to get men to replace them. This continued as time went on." 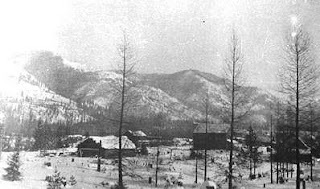 This picture of Noxon, circa 1910, was taken in two frames. Looking north at the mountains across the Clark's Fork River. Courtesy Stewart and Agnes Hampton collection. "Throughout this region the underlying rock is sedimentary in origin and made up of sandy deposits which have been changed by pressure and heat into sandstones, shales, conglomerates and quartzites. All formations, pre-Cambrian in age. Few of the strata are much folded; faulting has been very extensive; the courses of larger streams have been determined in part by faults. Strata are the same age as the formation in the Coeur d'Alene mining district. Extensive faults and occasional appearance of igneous intrusions indicate presence of ore bodies is possible. Copper, gold, silver and antimony are minerals exposed by prospectors. Several mills have been constructed but all have been idle for a number of years. Agriculture is confined to the narrow creek bottoms and low benches bordering the Clark's Fork River." Second Trout Creek Ranger Station. Circa 1912. The first station burned in the 1910 fire before it was completed. Courtesy Benjamin F. Saint collection. The Noxon and Bull River ranger stations had been built and the Trout Creek station was being improved with a view of making it a Forage Ranch as well as a district headquarters. Architecture was directed to some extent by the government. Plan No. 16 of the Forest Service Standard Plans was under roof and ready for finishing, at a cost of $208.48 for material, and $96.25 for labor, when the 1910 fire' gripped the fledgling agency, sweeping away their hard won achievements. "The replacement station at Trout Creek was built according to plans similar to the Noxon cabin but with a half pitch roof, 10 foot walls and double 4" vertical grain flooring making it more attractive than the Noxon building. Material-$389.02; labor-$196.12."11. Development of the locations was equally as important as the buildings and the government faced the same challenges as the homesteaders did. Trout Creek station included a clearing on a bench about fifty feet above the creek covered with snags, stumps and windfall left by old fires. The cost of clearing and seeding including all labor and supplies was $54.14 per acre. An estimated cost of $15 more to take out the remaining stumps could raise the yield from the previous season high of one ton per acre to one and a half ton per acre of red clover twice a year, "as our neighbor across the fence hauls off."11. Hoping to raise enough forage on the hundred acres of the station to ship to and supply all of the rangers, the station was the first to be enclosed with a two-strand, twisted wire without barbs, four wire fence on posts a rod apart. This type of fence was so satisfactory it was specified in all estimates for fences thereafter. Ambitious plans were made to fence the Baker Station and put the meadow in condition to raise good hay to be cut and stacked so that any Ranger not needing his horses during the winter months could winter them there. Forty acres at Lake Station were enclosed to pasture Government horses at the Supervisor's headquarters. "the original cabin on this station was on it when withdrawn as an administrative site but was burned during the 'Big Fire'."11. Granny and Pauline Gordon's Ranger Station was the epitome of what every government agency strove to be. Socials, dinners, and gatherings of all sorts created pleasant memories for participants, government or civilian. Forest service crews worked from there. Travelers enjoyed the hospitality afforded by the helpful couple. Big gardens, plenty of venison, fish and wild berries provided the means for Mrs. Gordon to gain wide recognition as an excellent cook. ﻿ Mt. Silcox and Mt. Hedley lookouts commanded a view of from four to six hundred square miles. Their line of vision encompassed the Clark's Fork valley as far east as Thompson Falls and west to Sandpoint, ID. Each was vital to the five rangers, eleven men and two clerks who were charged with conducting the governments business on the entire 1,020,960 acres of public land. Although the forest service had it's detractors there is no denying that the jobs it brought to the valley played an important part in the continued settlement and prosperity. Eighteen men found temporary employment with the forest service that summer. 11,967 acres in the forest were taken within the boundaries under the homestead laws, 3,537 acres of this under the Homestead Act, June 11, 1906. Of these, l,066 acres were cultivated which was about 14% of the total cultivatable area. The principal products were hay and enough garden produce for home consumption. Pauline Reithmiller Gordon atop Squaw Peak Lookout. Ca. 1910-12. Hedley nailed W. B. Russell with timber trespass and Clifford Weare with saloon trespass, taking delight in combating 'cedar savages', and prosecuting them successfully. Many area residents resented the actions of the 'government's men'. The topic of forest management was every bit as controversial in the valley in its beginnings as it is today. And a number of the early residents continued to ignore the governments warnings, relying on the reality that there were not enough men to properly enforce the laws. Counting on the fact that the lands were not completely surveyed and doubt could be thrown on whether a stand of timber actually belonged to the railroad or was public land, they continued to 'help themselves'. After all, a careless campfire could burn up any evidence. 1. Sanders County Independent Ledger, March 1906. Ferdinand Augustus Silcox, Vol II, No. 3, Summer, 1942; Information Special Articles, F.A. Silcox, December 5, 1941, by Elers Koch, Assistant Regional Forester; Gifford Pinchot; Private and Public Forester; Theirs Be The Power; and One Third of A Nation. Bob Saint oral tape-recorded history. 1a. Sanders County Ledger, Feb. 2, 1906. 1b. Sanders County Ledger, June 7, 1907. 2. Ben Saint story on Forest Service days. 3. Bob Saint tape-recorded oral history 1983. 5. April l, 1911 Cabinet Forest Service Journals. WEEKSVILLE-S.24 & 26,T21,R27W 80 acres. 7. Tape recorded oral histories, Frank Berray and Clifford R. Weare. George Huffman was just building Buck's store that year. It would not be known as Buck's for quite some time. Neither did Greens name show up on any forest service employee rolls. Yet pictures exist of the one and a half story house at this location. McJunkin, who was succeeded by 'Doc' Smith, were located in this area earlier. And another house was across the road from the forest guard station. The Gordon children's grandmother occupied it. There are also pictures of Mrs. Green and her children, taken at Heron. 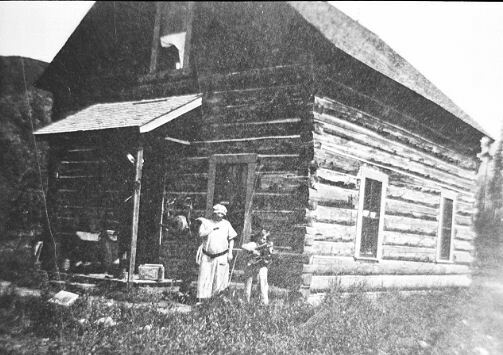 Ben F. Saint's forest service diary states, "we built the Ranger's one and a half story house". 8. Cabinet Forest Journals 1911. 9. 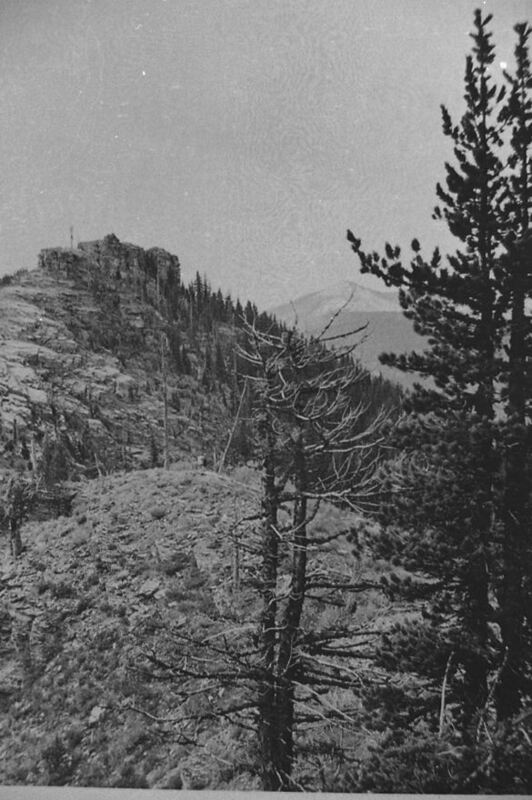 1911 Cabinet Forest Service Quarterly Report. 10. Benjamin F. Saint's Forest Service Story. Saint took and passed his Ranger's Examination, getting his first Assistant Ranger appointment in 1910, just in time to get some real fire fighting. 11. I. S. Murphy, Forest Assistant in 1908. Thanks very much for posting all this great information online. I just recently rented the Bull River cabin for 6 days and wanted to find out more about it. One thing that confused me was that the kiosk out in front of the cabin named Gransville's wife as "Blanche." While inside, the framed photos on the wall named her as "Pauline." I wondered who was right. Your well written articles cleared that right up. Thanks again.